Update: i think this has been identified as a purple passion flower! I need to track down the name. I've been seeing them lately too and love them. They are so odd. That is so cool. Whatever it is, I wonder if it will grow up here too. Nice find Brian. Never seen anything like it before either. Looks strange, but lovely too. And I adore its blue and purple color! Looks just like our Purple Passion Flower. They have a marvelous scent. I'm not sure they are in your area, however. May be something similar. I've never seen something like this either. I thought it was a pinwheel or something in the thumbnails. 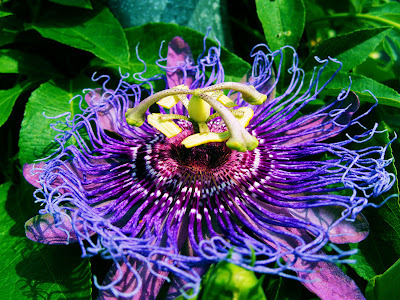 It is a purple passion flower. My vine was devoured by caterpillars this week! Yes, it is a Passion flower. Such an unusual flower and really sceneted on warm evenings. It looks like it should be growing in The Rain Forest! Very strange looking, but very pretty!